The UPD350 is a highly integrated small form factor USB Type-C/PD controller compliant with USB Type-C™ specification and USB Power Delivery specification v.3.0. UPD350 provides cable detection and orientation, and implements baseband communication with a partner USB Type-C/PD Device. 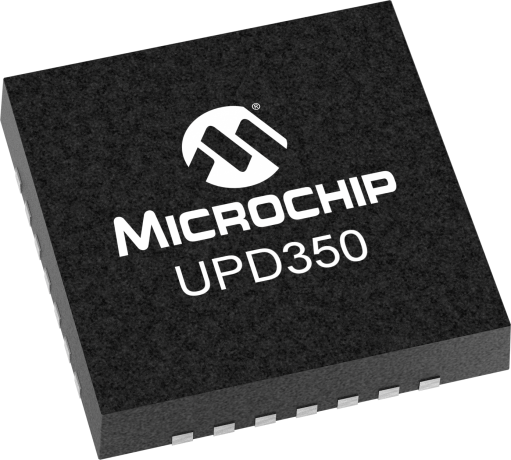 The UPD350 is designed to function as a Companion Power Delivery Controller to an external MCU/SoC or USB hub, using the integrated I2C/SPI interface. The device is capable of controlling up to 100W of Power Delivery current and voltage using an external power device. The UPD350 integrates two VCONN FETs with Rp/Rd switching. Alternate Modes support is provided including DisplayPort, HDMI and Thunderbolt. A software stack running on the companion IC executes support DRP modes, power profiles and alternate mode functionality. UPD350 targets a wide range of applications in Consumer (Notebooks, Monitors, Docking Stations) and Industrial (Point of Sale Systems, Printers) market segments.